Give to Your Favorite Classroom on #GivingTuesday and We’ll Match It! Throughout the month of August, Subaru is helping teachers and students nationwide, by providing the necessary school supplies teachers need to teach, and students need to learn by partnering with AdoptAClassroom.org. 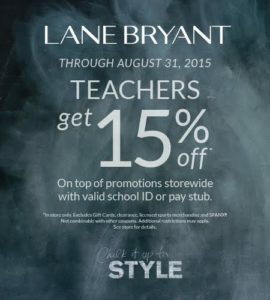 Lane Bryant is raising their hand again to support teachers! Last year was such a huge success they’re bringing back Chalk it up to STYLE for another year! 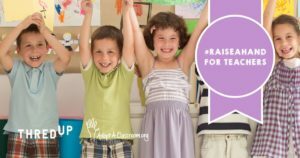 Check out what they have in store for the entire month of August to raise money for teachers nationwide AND how you can help. Can we guess what kind of teacher you are based on your fashion preferences? With the help of Lane Bryant we’re going to try! Pick your favorites below—then head into any Lane Bryant store to get a 15% teacher discount and support local classrooms across the country. This Back-to-School season, support teachers when you vote on your favorite look in the Stage Stores Facebook #StyleShowdown. Did you know that seven out of 10 teachers purchase apparel items like jackets, socks, and shoes for their students? Proper school clothing for students is more important than you might think. 85% of teachers we surveyed said that students lack confidence when they come to class without the proper clothing or supplies. We’re overwhelmed with excitement and gratitude here at AdoptAClassroom.org! 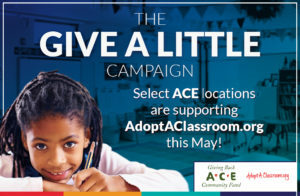 This May ACE Cash Express raised $138,000 for teachers with their Give A Little Campaign. This month we’re celebrating our partner Farmer’s Insurance, who got great coverage in People!